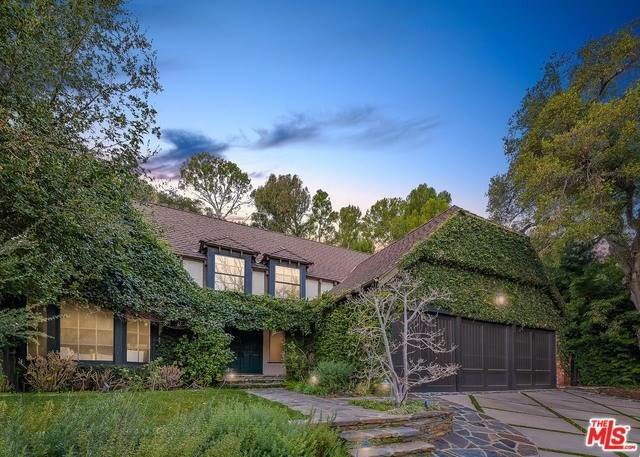 Beautiful Country English home, located on a tranquil cul de sac off lower Mandeville Canyon, has the benefit of both quiet canyon living and convenience to restaurants and shops in Brentwood. A gated driveway with three car garage leads you to this 4 bedroom, 4.5 bathroom home. Off the entry is a library/office with built in cabinetry. To the left of the entry is the formal living room with tall ceilings and wood beams, which flows into the dining room. Updated cook's kitchen with Carrera marble counters, stainless steel appliances, and breakfast nook. An adjoining family room with fireplace has French doors that open to the garden. A spacious laundry room and updated guest suite with outdoor access/separate entrance complete the first floor. Upstairs, are three en-suite bedrooms, including the Master, with updated baths. The pool, spa, and outdoor dining area are ideal for entertaining. The approximately 22,700 sq. ft. lot contains mature foliage, walking path, and fruit trees. Lot Size: 0.52 Acres / 22733 Sq. Ft.
SchoolsClick map icons below to view information for schools near 13176 Boca De Canon Lane Los Angeles, CA 90049. Listing provided courtesy of Hugh Evans, Compass. Home for sale at 13176 Boca De Canon Lane Los Angeles, CA 90049. Description: The home at 13176 Boca De Canon Lane Los Angeles, CA 90049 with the MLS Number 19431216 is currently listed at $4,430,000 and has been on the Los Angeles market for 69 days. You are viewing the MLS property details of the home for sale at 13176 Boca De Canon Lane Los Angeles, CA 90049, which includes 4 bedrooms, 5 bathrooms and has approximately 3768 sq.ft. of living area.